My family has the best banana bread recipe. Ever. I hate to brag, but it’s true. Back when I was young and learning to cook I tried out some banana bread recipes that were decent, before my mom took me aside, handed me a recipe card and informed me that it was the only banana bread recipe I’d ever need, because it was the best! Well, she was wrong about at least one thing, because I guess she didn’t know that a time would come when a I’d need a vegan banana bread recipe. But that’s not a big deal, because veganizing the old family favorite recipe was no biggie! Oh, and well, maybe she was wrong about it being the best, because, in fact, this vegan version is actually better. The great thing about veganizing banana bread is that you don’t have to fuss over figuring out the right egg substitute. Bananas do the job! 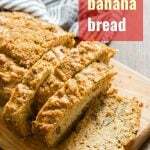 I use bananas as an egg substitutes in all kinds of vegan baked goods, but when it comes to banana bread, they’re already an integral part of the recipe. Make sure your bananas are medium-sized and overripe. You want lots of brown spots! Mash them up with a fork or potato masher, and then stir in some oil, sugar, brown sugar, and vanilla. Dry ingredients go in next: flour, baking soda, cinnamon (it works — trust me), and salt. Stir everything just until blended. Don’t overdo it! Optionally, include some stir-ins. Walnuts are my go-to, but pecans and chocolate chips are great as well. Pour the batter into a prepared loaf pan, smooth out the top, and sprinkle with brown sugar. This will give you an awesome crust on top! Bake your loaf for 50 minutes at 350° and then let it cool for a few minutes before slicing. This stuff is perfect with a cup of coffee or tea. Be sure to use overripe bananas for this. They should have lots of brown spots — the more the better! 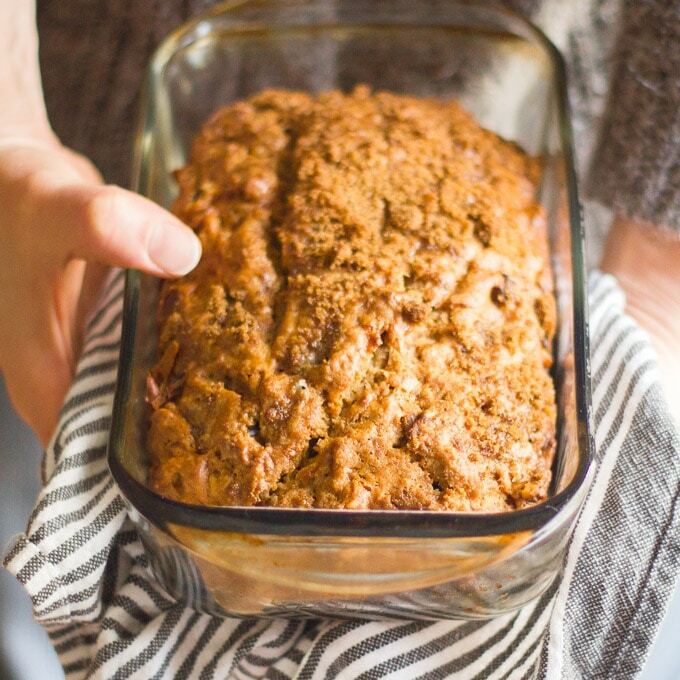 If you have overripe bananas but aren’t ready to make banana bread, just freeze them! Peel them, seal them up in freezer bags, then thaw when you’re ready to bake. Whatever you do, don’t overmix the batter! You want to stir just until the wet and dry ingredients are mixed, and no more. 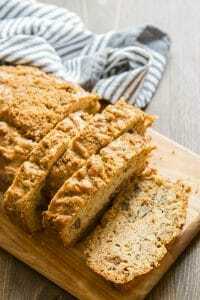 Mixing too much will overdevelop the gluten, making your bread tough. HELP! My bread didn’t rise! Usually old baking soda is the culprit. Test yours by sprinkling it in some vinegar. It should fizz. If not, toss and replace it. Can this bread be made gluten-free? I’m not sure! I think your best bet would be to replace the flour with an all-purpose gluten-free blend. 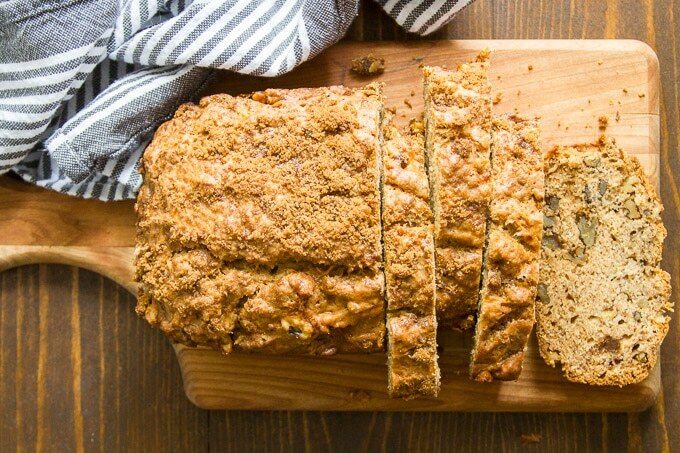 The best banana bread ever and it's vegan! 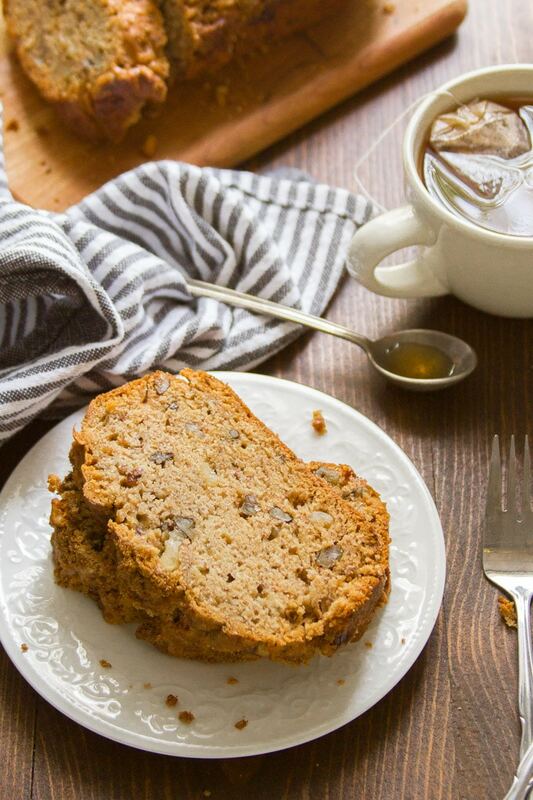 Perfectly sweet, moist, and topped with a brown sugar crust, this delicious banana bread is super easy to make and customizable with your favorite stir-ins. 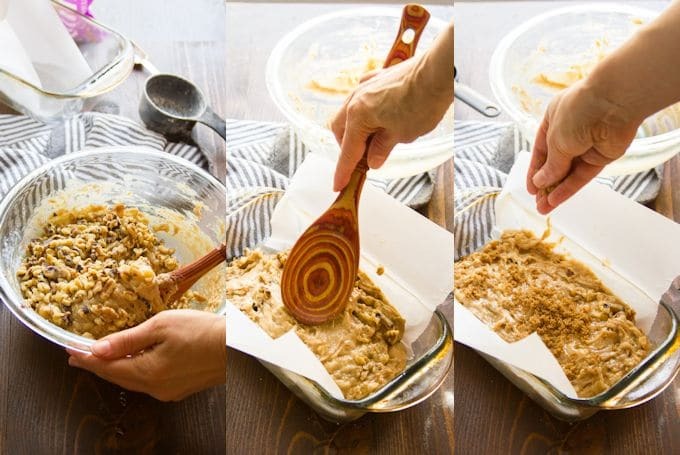 Lightly oil a 9-inch loaf pan and arrange a strip of parchment paper width-wise along the center, with just a bit hanging out over each side. Peel the bananas and place them into a large mixing bowl. Mash them well with a fork or potato masher. Add sugar, brown sugar, oil, and vanilla to the bowl. Stir until well-mixed. Add the flour to the bowl, then sprinkle the baking soda, cinnamon and salt on top of the flour. Stir everything together just until mixed. Don't overmix. The batter will be thick. 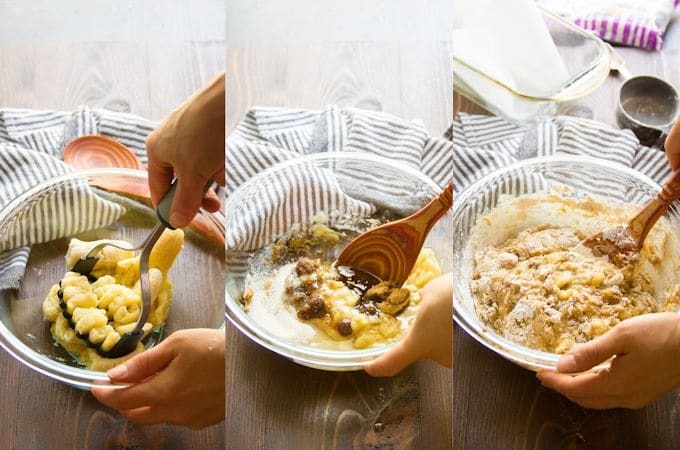 Spoon the batter into the prepared loaf pan and smooth out the top with the back of a spoon. Bake for 50 minutes, or until a toothpick inserted into the center comes out clean. Remove the pan from the oven and transfer it to a cooling rack. Allow the loaf to cool for at least 15 minutes before removing it from the pan. I just noticed that the recipe spells out: “bake for 50 minutes, let cool for 15”. …but your directions above say to bake for 15!! You may need to correct ASAP! Try applesauce! I’d love to hear how it works out if you do! Applesauce might work, but I haven’t tried, so no guarantees! Was so happy to have excellent results on my very first try with this recipe. Yay!! I’m so happy to hear that! I haven’t measured, but I’d say approximately 1 cup. Just baked this and it is lovely!! !